We warmly invite you to join the presentations by Satellietgroep & Onkruidenier of the project 'Waterpionier'. Can we taste climate change and influence of mankind in the Anthropocene? With special thanks to all participants, partners, Province of South-Holland, municipality of The Hague. APPLY FOR RESIDENCY WITH SATELLIETGROEP AT BINNENLAND ATELIER MONDRIAAN FONDS 2017. DEADLINE SEPTEMBER 16, 2016.
unique hand blown objects made from Zandmotor sand. Satellietgroep is very proud that Atelier NL has choosen to work with Satellietgroep and has developed this new visual narrative of the hybrid relationship of mankind and man made nature. This Zandmotor ZandGlas is a prime example of Innovatory Heritage, an innovative method of storytelling through arts, design and science for broader audiences. These are the very first prototypes of a new serie and a real collector's item. 'ZandGlas' is not just for connoisseurs – but for all coastal, art and design enthusiasts with a passion for history and innovation. 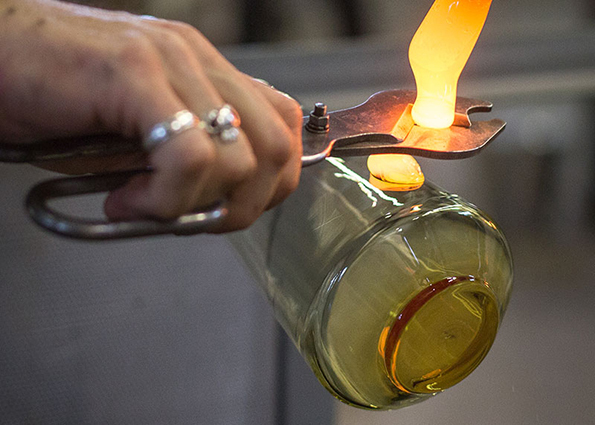 Take advantage of this moment as we embark on a new foray into the world of glass. Consider entrusting Atelier NL to craft a 'ZandGlas' specially for you. Make the production of this unique glassware possible by subscribing before the end of August to obtain one or more of the first autographed prototypes. 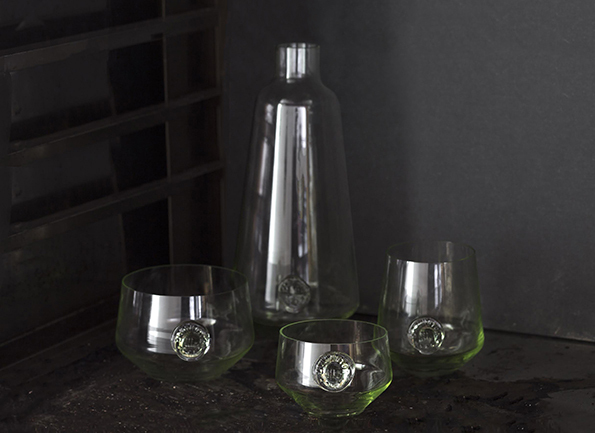 'ZandGlas' from the Zandmotor consists of a carafe (€ 295), a large drinking bowl (€ 115), a medium-sized glass (€ 95), and a small glass (€ 85). The entire set is now available for € 560. All objects are marked with a glass stamp indicating the origin of the sand. After intensive research and experimentation, designers Nadine Sterk and Lonny Ryswyck of Atelier NL managed to melt local 'wild' sand dug from the Zandmotor, into unique objects of glass. The collection is called 'ZandGlas'. Each piece is made from fused sand, forming a magnificent set composed of a carafe and three drinking glasses of varying size. These are tangible objects made from sand. They are beautifully crafted and tell a stunning narrative about the origins of the Netherlands and the sea, currents, winds, rivers, time and mankind. These are the very first glass products from a series Atelier NL will create out of sand from the dunes, beaches, rivers, deserts, mountains and sandpits. Atelier NL used the sand from the Zandmotor at the invitation of artist collective Satellietgroep and in collaboration with our network of scientists. 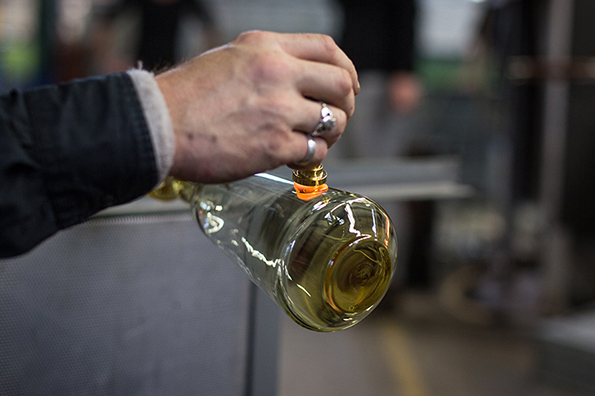 For the manufacture of the limited edition, the designers worked together with Gert Bullée, top glassblower in the Netherlands. At high temperatures, the wild sands of the Zandmotor melt and eventually transform into characteristic, pale green glass. Sleek and elegant design in a sophisticated colour, and with charming imperfections that make each object unique. 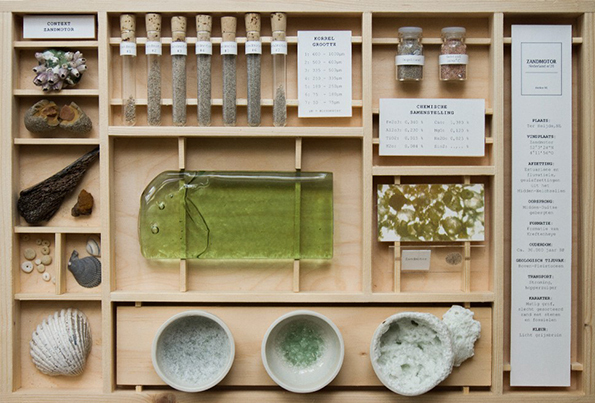 Atelier NL makes products that showcase the riches of the earth and the value of local raw materials. Each material yields a different product and tells a different story. One example is the successful 'Clay Service', which Atelier NL will soon produce in-house. The glass industry uses only pure white sands which can only be found in a small number of sand quarries worldwide. In order to challenge the conventions of the contemporary conservative glass industry, since 2010 Atelier NL has been collecting wild sands from dunes, beaches and sandpits in various places all over Europe – thus experiment constantly with this natural material, including studying geological time, particle size, chemical composition, microscopic imaging and related considerations. Their project 'SandBank' reveals the potential of local, wild sands. The designers followed the path of ancient Roman glass traders, took samples of eighty sands, mapped and classified them, created special sand boxes and carried out over a thousand tests. Sands from different locations provide varied results because of their wide mix of minerals and other components that adhere to the grains, yielding various colors and textures. Special thanks to Bert van der Valk (geologist), Iris Pit (PhD candidate STW-NatureCoast), Gert Bulée (glass blower), Rob Singels (Philips GSP), Ad Waterschoot, Frans van Dommelen (glass instrument makers) and all other participants who make this project possible. Copyright © 2016 Atelier NL, All rights reserved. You can also contribute to the activities of Satellietgroep! Spread the word or invite us for a presentation, research, collaboration or exchange project. Satellietgroep works also on commissions. Feel free to contact us at satellietgroep@gmail.com or browse our website www.satellietgroep.nl for ideas. Satellietgroep programs 3 DCR Gueststudios at DCR, the cultural incubator in The Hague that also houses 35 permanent studios for artists and designers, including the studio of Satellietgroep, Zaal 3 - laboratory for performing arts of Theater aan het Spui, sound studio Loos, Cloud Danslab and exhibition space Nest. Jacqueline Heerema, Ronald Boer & Francois Lombarts, the curatorial team of Satellietgroep. Artists collective Satellietgroep (The Hague, 2006) explores through arts the social and ecological impact of the sea and coastal transitions on cities, people, communities and environments, and vice versa the influence of mankind on coastal transitions and climate change in The Netherlands and abroad. Our aim is to enhance public and professional awareness. Satellietgroep hosts artists in residents for artistic fieldwork, collaborate with locals and experts and develop new concepts and works that reflect the resilience of coexistence of man and water, in past, present and future. Long term projects are 'Badgast' - artist in residency program at The Hague/Scheveningen (2009-2014), 'Now Wakes The Sea', the international exchange residency program in collaboration with international cultural partners (since 2012). Since 2014 Satellietgroep develops the first artistic research on the Zandmotor, the newest innovation on coastal protection called Building with Nature. In these programs artist in residencies are used as a research method to enable artists and scientists to do fieldwork and to work on site with local partners, coastal communities and experts in order to map out and research the current status of coastal transitions and to generate new narratives and perspectives. The programs function as an alternative source for collecting. New concepts and works are developed that we connect and contextualize with existing works for public events like traveling film festivals, exhibitions, workshops and presentations at expert conferences. Artist in residents are invited to critically explore and visualize the zones of coexistence of man and water and reveal different perspectives. By interconnecting coastal communities, arts and science we share local knowledge on global level to gain sustainable insights on coastal transitions that transcend local and national issues.